1.1 Ready to Make Your Own? I originally designed this free summer headband crochet pattern when we were on a camping trip on windy Santa Fe, New Mexico. My hair, even short as it is, was unruly and I needed a quick solution. So, I whipped up a headband and….ta da…problem solved! So, when it was time create a quick and easy project for 4th of July, I pulled this from my bag of tricks and wrote up the pattern for you…added some stars for a patriotic touch and, there you have it, the Stars and Stripes Summer Headband. And….for the perfect finish to the whole project, it’s being modeled, here, by my friend’s precious baby, Hannah. This pattern can be made to fit any size. Instructions for adjustments included. (size 4) 100% cotton yarn, approximately 20 yards. Gauge isn’t important in this pattern. 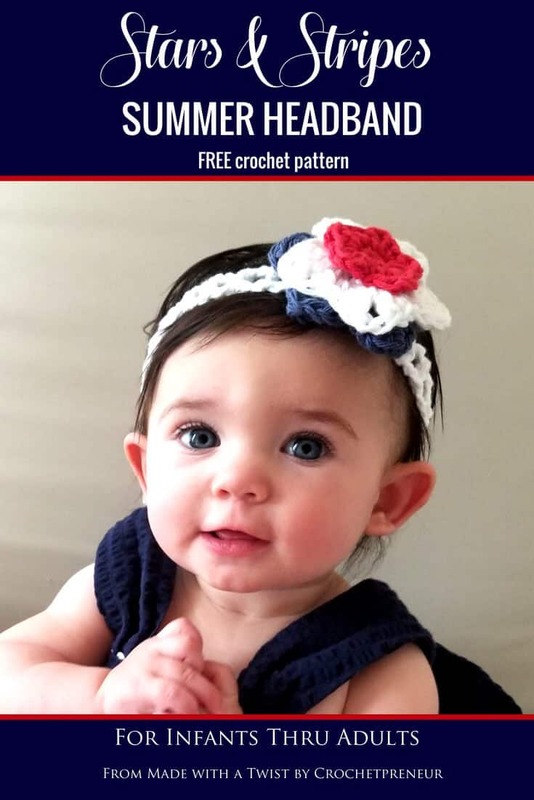 The headband is made in short rows and stars are worked in the round. The initial CH3 at the beginning of the “stripes” row is included in the stitch counts as one DC. (The CH4 is counted as 2 stitches, a DC and CH). work into a magic circle. Block your three stars. Find a crochet motif blocking tutorial here. Layer the stars from largest to smallest and sew them to the headband. And you’re done wasn’t that easy?! Looking for more holiday patterns? Check out our Sun and Sand Bucket Hat pattern in sizes 3-6 months through 10 years! So stinking cute!! I love that this has so many size options too. Thanks for sharing.